The NeoVI Fire 2 PC-interface unit by Intrepid supports multiple in-vehicle networks and protocols. It is not just an update from its predecessor. Intrepid has released the NeoIV Fire 2 multi-protocol unit, which provides multiple hardware interfaces for vehicle networks. This includes eight CAN FD interfaces, four LIN ports, and one Ethernet channel. All these interfaces run simultaneously and the messages are time-stamped in hardware. The USB port used to connect the device to the PC is galvanically isolated. The product can also be operated in a stand-alone mode. It can run real-time scripts, log data to a removable microSD card, and simulate ECUs (electronic control unit) as well as gateways. With these features, it is possible to run a script to reflash ECUs using data from the microSD card. Since some users prefer to write their own software, the gateway supports three APIs: neoVI DLL API, SAE J2534 API, and the TMC RP1210 A/B API. The neoVI DLL API includes examples for popular development environments. Examples and drivers for both Windows and Linux are also available. Intrepid’s Vehicle Spy software supports the multi-protocol unit. With it, users can monitor and transmit on all networks simultaneously. Vehicle Spy is required to configure stand-alone mode. Users can take advantage of the interface unit to load databases and to write and to debug scripts before downloading them to the device. The product comes with a real-time scripting engine that can be used to perform real-time messaging. For example, an engineer creating an application can load a script into the hardware and interface with the script variables, allowing microsecond measurement and control. With the hardware acceleration feature, Vehicle Spy can also be configured to send real-time functions to the device such as periodic messaging, replay, or scripting. It is also possible logging data to a removable microSD card, which uses a real-time, fail-safe FAT32 storage system. The implemented power management system automatically powers down the gateway and can wake it up again based on network activity or the connection of a PC. While the product was developed primarily to provide additional vehicle networks and features, it also provides significant improvements over its predecessor, the The NeoVI Fire. 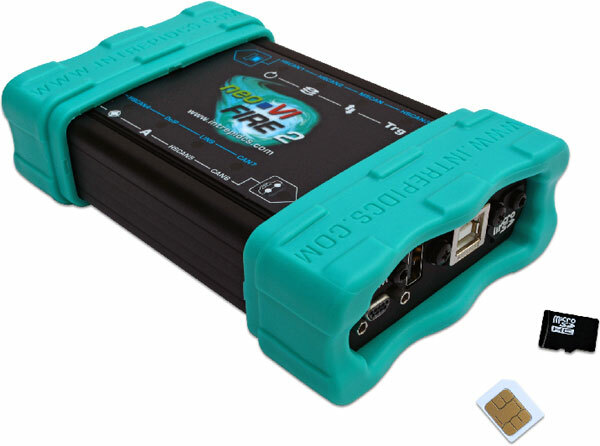 These include a more robust case and connectors, much larger script space, SD card data offload over USB, the ability to power the device from USB during configuration, support for a larger voltage range, and an expanded voltage range on I/O channels.